Authorities have finally surrounded a Southern California wildfire that destroyed some 1,600 homes and other buildings and left three people dead. A California sheriff says two more sets of human remains were found Wednesday, bringing death toll from a wildfire to 83. Butte County Sheriff Kory Honea says more than 560 names remain on the missing list. The blaze that started Nov. 8 leveled Paradise, destroying more than 13,000 homes. Paradise is about 140 miles north of San Francisco. Northern California sheriff says 2 more dead in wildfire, bringing death total to 83. Butte County Sheriff Kory Honea says more than 560 remain on the missing list. The daughter of a man killed in California’s deadliest wildfire is suing Pacific Gas & Electric Co., saying the utility could have prevented the blaze. Neva Rodrigues filed the lawsuit Wednesday in San Francisco. The lawsuit says a body was found in the burned home where her father, 73-year-old Jerry Rodrigues, lived alone in a Paradise mobile home park. The cause of the fire has not been determined. PG&E reported an outage on a transmission line near the time and place where the fire began. The company is targeted in at least two other lawsuits filed by people who survived the blaze but lost their homes. A PG&E spokeswoman says safety is the company’s highest priority. The company has warned investors its liability may exceed its insurance if it is found responsible. Rain is falling on the scorched ground left when a monstrous fire tore through the Paradise area, killing scores of people and destroying thousands of homes. The rain was causing concerns Wednesday about mudslides and other problems in Northern California. In a Walmart parking lot where thousands of evacuees had taken refuge, Amy Sheppard was packing her belongings into a black plastic garbage bag in the rain. The 38-year-old woman says she plans to go to a hotel where her sister and 1-year-old niece are staying after the three of them camped in the lot for four days. The family lost their home in Magalia. Several dozen tents remain at the lot, although most services have been stopped. Sheppard says many of the remaining people are homeless, not victims of the fire. Green Bay Packers quarterback Aaron Rodgers says he’s donating $1 million to help those affected by a wildfire near his hometown that decimated a town and killed at least 81 people. Rodgers who was born and raised in Chico, California, where evacuees are being sheltered after the blaze destroyed the nearby town of Paradise, says the money will go toward recovery and rebuilding efforts. He said in a video posted Wednesday on his Twitter account that he is partnering with the North Valley Community Foundation to raise money for those in Butte County who were affected. Wearing a “Butte Strong” sweat shirt, Rodgers says one of his corporate partners, State Farm, will donate $1 for every retweet of his post and up to $1 million. The blaze destroyed more than 13,500 homes. Firefighters quickly doused a flare-up of Southern California’s huge and stubborn wildfire, nearly two weeks after it broke out. Fire Captain A.J. Lester says no structures were threatened when a hot spot ignited brush Wednesday in a remote area of Bell Canyon in Ventura County. Lester says crews on two engines knocked the new flames down. The 151-square-mile (391-square-kilometer) Woolsey Fire has destroyed 1,643 structures since it erupted Nov. 8. It was 98 percent contained as of Tuesday evening. Forecasters say mudslides and rockslides are possible when rain spreads into the burn zone Wednesday. About 80 travel trailers are at McClellan Air Force Base near Sacramento as officials figure out where to deploy them. Federal Emergency Management Agency spokesman Frank Mansell says there’s no timeline for when the trailers will he placed for use, but it will likely take weeks. Mansell says FEMA would ideally place trailers at the site of people’s destroyed homes and is also looking for a larger site such as the fairgrounds. It takes time to assess whether the sites have appropriate electricity, sewer or septic and other infrastructure to support the trailers. Mansell says FEMA is also working to put people in hotels or find them other sustainable lodging. He says in most disasters only about 10 percent of victims use FEMA-run shelter. He says the agency can get as many mobile units as needed. Former California Gov. Arnold Schwarzenegger has made a surprise visit to firefighters battling a deadly blaze in Northern California, helping serve them breakfast while providing encouragement. He said he wanted to visit the scene and show his appreciation for firefighters who risk their lives. The actor is also slamming President Donald Trump for blaming the wildfire that killed at least 81 people on poor forest management. Forecasters say rain expected over areas of Southern California burned by recent wildfires will probably be significant enough to cause problems. The National Weather Service says the rain will spread into the region Wednesday afternoon and evening, and meteorologists have added a slight chance of thunderstorms. The service says mudslides and rock slides will be possible, especially in areas burned this month by the Woolsey and Hill fires west of Los Angeles. The latest assessment of the 151-square-mile (391-square-kilometer) Woolsey Fire shows 1,643 structures destroyed and 364 damaged. The fire was 98 percent contained as of Tuesday evening. Light right is falling in some areas of Northern California, where a deadly wildfire has been burning for nearly two weeks. Moderate rain is expected later Wednesday in the Paradise burn area, where a wildfire killed at least 81 people and destroyed more than 13,000 homes. Rain forecast through the Thanksgiving weekend could aid crews fighting wildfires while complicating efforts to recover human remains. The National Weather Service issued a flash flood watch, saying brief periods of heavy rain could unleash mudslides. Rain is expected along the central coast and in Southern California later in the day. Rain in the forecast starting Wednesday could aid crews fighting Northern California’s deadly wildfire while raising the risk of debris flows and complicating efforts to recover remains. The National Weather Service has issued a flash flood watch Wednesday for the decimated town of Paradise and nearby communities. 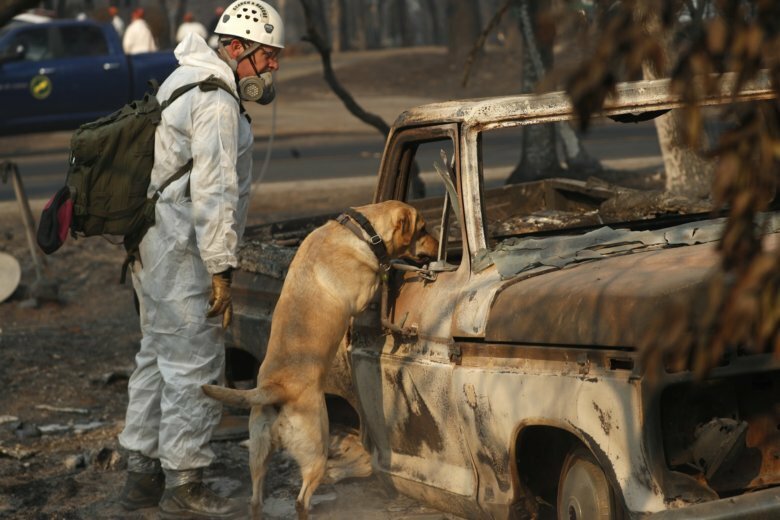 The Camp Fire, which has burned nearly 238 square miles (616 square kilometers) and destroyed around 13,000 homes, is 75 percent contained. Teams continue sifting through ash and debris as they search for bodies. With the death toll at 81 in the state’s most destructive wildfire, there are still nearly 870 people still unaccounted for.